I grew up around handmade objects – wooden spoons, ceramic plates and mugs, iron fire tools and even macramé and weaving. 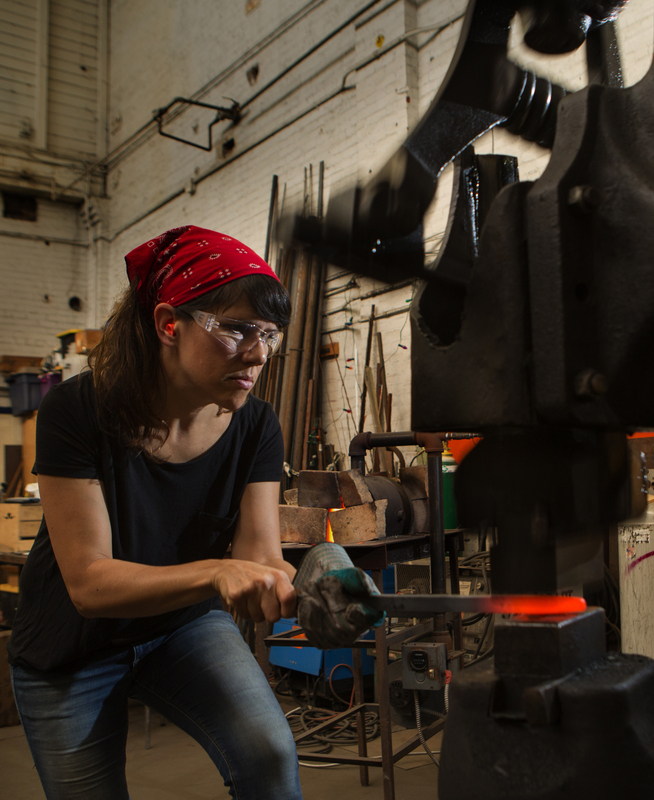 Living in the handmade world resulted in my path as a designer-artist via the traditional craft of blacksmithing. My apprentice years were spent making architectural ironwork- gates ,railings and lighting which now informs my current jewelry and accessories line. I extract architectural lines and shapes from both the built environment and nature to create earrings and necklaces. My designs have been inspired by topography, art deco motifs, traditional ironwork shapes. I am now exploring the emotional meaning of geometry, trying to distill an idea of a one's interior landscape into symbol. I am firmly rooted in the craft tradition and design using heat and hammer, it is a direct, satisfying process. For me, making is a means of connection. Connection to the history of craft. Connection to the elements of fire and force that shape the work. And finally, connection to the collector that chooses to adorn themselves with my designs. Erica has also taught workshops at both Penland School of Craft in North Carolina, and Haystack Mountain School in Deer Isle, Maine. Upcoming workshops will be listed on the In Real Life page.